From the 1860s, terraced cottages and some substantial houses were built on former market gardens and brick­fields and the present streetscape was almost complete in 1890. 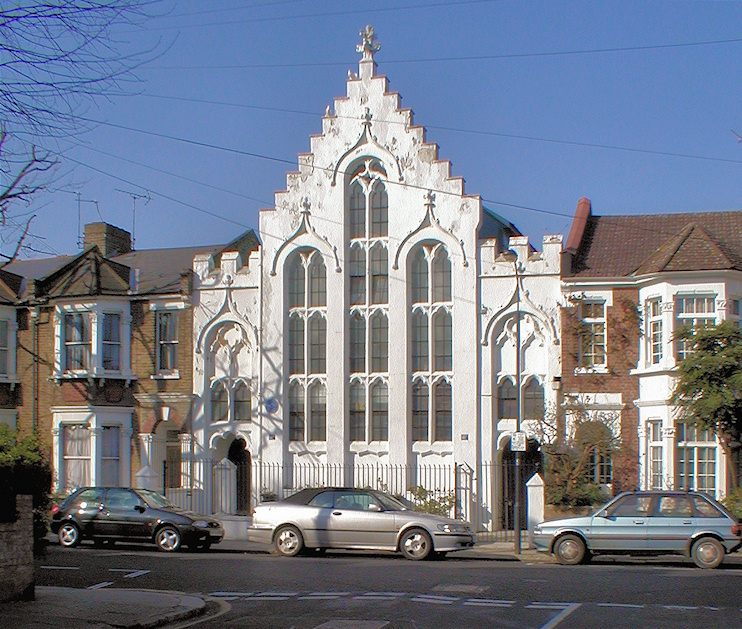 Shown in the photo above, a mission hall was constructed in 1883–4 on a site between Iffley Road and Tabor Road given by the Bishop of London. It was estab­lished to provide ministry for the expanding resid­ential district between Glenthorne Road and Goldhawk Road but its primary purpose is believed to have been a Sunday school. More recently used as a studio by a scenic artist, the building was belatedly grade II listed in 2015. By the mid-20th century many of the neighbourhood’s properties were in such a run-down condition that the council considered demol­ishing some streets and replacing them with municipal housing. Instead, the homes were progress­ively improved and from the early 1980s gentri­fic­ation took hold. With tube stations at three corners and its varied and pretty archi­tecture, Brackenbury Village (or simply Brackenbury) saw numerous conver­sions and restor­a­tions in the late 20th century, with an accom­pa­nying influx of specialist retailers, services and eateries, and it is now one of the most desirable neigh­bour­hoods in inner west London. The cluster of shops and cafés at the junction of Brackenbury Road and Aldensley Road adds to the sense of community. There is another Brackenbury Village in north Ickenham, in the London Borough of Hillingdon, but the name is not widely used. Aylsham Drive is its main thoroughfare.